Neurosurgical Consultants: Understanding Neurological Surgery: What Is Neurological Surgery And Why Is It Necessary? Neurological Surgery is a discipline of medicine, and that specialty of surgery which provides the operative and non-operative management (i.e., prevention, diagnosis, evaluation, treatment, critical care, and rehabilitation) of disorders of the Central, Peripheral, and Autonomic Nervous Systems, including their supporting structures and vascular supply; the evaluation and treatment of pathological processes which modify the function or activity of the Nervous System, including the Pituitary Gland; and the operative and non-operative management of Pain. Neurological Surgery encompasses the treatment of adult and pediatric patients with disorders of the entire Nervous System. This includes disorders of the Brain, Meninges (the covering of the brain and spinal cord); disorders of the Skull; disorders of the Blood Supply to the Brain (including the Extracranial Carotid and Vertebral Arteries); disorders of the Pituitary Gland; disorders of the Spinal Cord and Vertebral Column (including those which may require treatment by spinal fusion or instrumentation) and disorders of the Cranial and Spinal Nerves throughout their distribution. A Neurosurgeon is a medical doctor who has received extensive training in the surgical and medical management of neurological diseases. The field of Neurosurgery is one of the most sophisticated surgical specialties and encompasses advanced surgical, imaging (CT and MRI scanning) and interventional technologies. Not all Neurosurgeons are engaged in every aspect of the broad field that encompasses Neurological Surgery. There are different levels of expertise required for some special interest areas such as is involved with Skull Base Tumor Surgery, Minimally Invasive and Microendoscopic Surgery, the surgical treatment of Pituitary Tumors and Acoustic Neuromas, Intracranial Vascular conditions requiring Microvascular Neurosurgical techniques, Pediatric Neurosurgery, Radiosurgery and several others. Obstruction of the blood supply to the Brain. These are classified as "Ischemic Strokes" which may result in a temporary neurological disorder such as Transient Ischemic Attack (TIA- a neurological deficit lasting less than 24 hours) or a Progressive Reversible Neurological Deficit (PRIND- neurological deficits that are more serious but will have reversed by 72 hours). In less fortunate circumstances the neurological deficits are permanent or "fixed". Hemorrhage related to Cerebral Aneurysms, Hypertensive Intracerebral Hemorrhage (bleeding in the Brain related to abnormally high blood pressure), and Arteriovenous Malformations (AVM), Angiomatous Malformations. 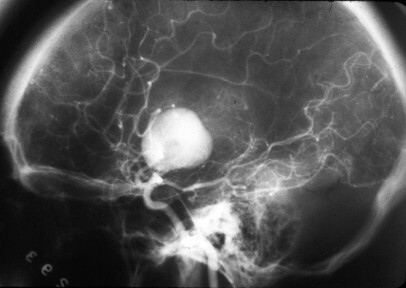 Figure 1A: Right Carotid Angiogram (Antero-posterior View) Extracranial-Intracranial (EC-IC) Bypass Graft. The "new" (Lower Arrow) vessel supplies both the Right & Left Cerebral Hemispheres. The "upper Arrow" indicates the anastomosis point to the Intracranial (Supraclinoid portion) Internal Carotid Artery. 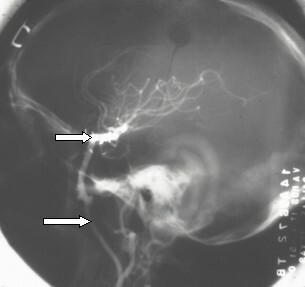 Figure 1B: Right Carotid angiogram-same patient demonstrating the "new" Internal Carotid Artery Bypass graft (Lower Arrow). The Upper Arrow indicates the anastomosis. The incidence of Subarachnoid Hemorrhage (bleeding covering the surface of the brain) is 10 per 100,000 persons per year. The most frequent cause of spontaneous Subarachnoid Hemorrhage is rupture of an Intracranial Aneurysm. The symptoms of Subarachnoid Hemorrhage are characterized by a sudden onset of severe headache that worsens over time, and includes nausea, loss of consciousness (with or without seizure) and vomiting. Depending on the extent of the bleed, symptoms of Subarachnoid Hemorrhage can also include visual sensitivity to light (photophobia), a stiff neck, and low grade fever. Symptoms before rupture of the Aneurysm occur in 40% of persons and are usually due to minor subarachnoid hemorrhage. These symptoms can also include headache or dizziness, and tend to go unnoticed. Sudden onset of double vision may occur as an aneurysm expands and injures a nerve inside the skull that controls eye muscles. Due to its size and location, the symptoms and neurological signs can include visual impairment and/or double vision and epilepsy. Approximately 30% of Subarachnoid Hemorrhages occur during sleep. Smoking is a major factor in increasing the odds of sustaining a Subarachnoid Hemorrhage. After a Subarachnoid Hemorrhage, most patients are hypertensive and experience changes in cardiac rate and rhythm. CT scans are the best initial diagnostic tool for evaluating patients suspected of having suffered a Subarachnoid Hemorrhage. CT scans can be positive in 90% of patients within the first 24 hours and in more than 50% in the first week after the hemorrhage has occurred. Spinal taps to sample the Cerebrospinal Fluid (CSF) may be required to evaluate some patients who are suspected of having had a Subarachnoid Hemorrhage. A spontaneous, Intracerebral (ICH) Hemorrhage is a blood clot within the substance of the Brain tissue that usually occurs abruptly. It is strongly correlated with hypertension. There are approximately 40,000 new cases in the United States annually. Stroke is the third leading cause of death in the United States, and ICH accounts for 10% of all stroke cases. Advancing age is a major predisposing factor for ICH: The incidence of ICH is two per 1,000 persons per year by age 45 and 350 per 100,000 persons per year for those aged 80 years or more. Hypertensive Intracerebral Hemorrhage can occur in different areas within the Brain with damage to some areas being associated with a very high death rate. Tumors of the Nervous System: There are disease processes which, if left untreated, can threaten the Brain, its ability to function and life itself. These conditions include mass lesions such as Brain Tumors and Brain Abscess which exert undue pressure on the Brain causing damage as the pressure inside the skull rises. Tumors that affect the Central Nervous System (CNS-Brain & Spinal Cord) include Benign (non-cancerous) and Malignant varieties; Primary Tumors (those which arise from Brain or Spinal Cord cells); Secondary or Metastatic Tumors (those cancers which spread from some other region to the Brain and/or Spinal Cord); Tumors of the Skull and/or Spine (Primary or Secondary Tumors involving the Bone that surrounds and protects the CNS); Tumors of the Peripheral Nervous System (nerves that lie outside the Brain and Spinal Cord which course throughout the body); and tumors of the Autonomic Nervous System (nerves that help control basic bodily functions). The incidence of Primary Intracranial Tumors is 11.5 per 100,000 accounting for approximately 35,000 persons per year in the USA. One of the most common types of tumors is the Glioma, which accounts for 50% of all Primary Brain Tumors. Figure 3B (Right): MRI Scan (Sagittal View-same patient). 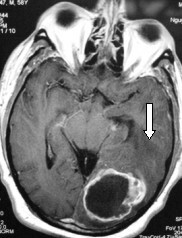 Glioblastoma with direct extension into the Brain Stem (Lower Arrow). Approximately 250,000 persons in the USA are affected by secondary (also called Metastatic) intracranial tumors each year. 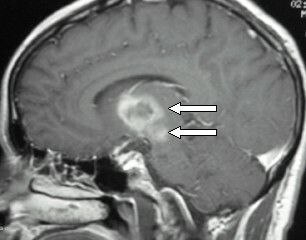 Cystic Metastatic tumor within the Left Occipitoparietal lobe with surrounding Brain swelling (edema) indicated by the "darker grey" (Arrow). Figure 4B (Right): MRI Scan (Sagittal View (same patient). 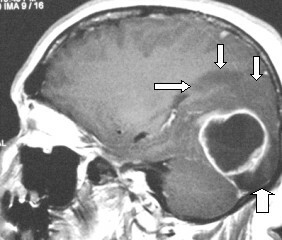 The swelling (indicated by the "darker grey" (Arrow) adds considerable "mass" effect beyond that of the Cystic tumor. A tumor in the Brain can become apparent when there is an increase in the pressure inside the skull (known as intracranial pressure or ICP) or when the tumor grows and compresses particular parts of the Brain. Slowly growing Brain Tumors may not become apparent clinically for many years since the Brain is compressible and may tolerate that compression quite well. Once the Brain can no longer tolerate any added mass, symptoms begin to appear. Once this happens it is actually quite late in the course of this disease process. Common symptoms associated with compression of the Brain can include nausea, vomiting, headache that is worse in the morning, blurred or double vision, drowsiness and a reduced level of consciousness. Tumors causing focal compression on or irritation of the Brain may cause seizures (epilepsy) and/or result in impairment of some neurological function (such as becoming weak in a hand, arm foot or leg.) Other symptoms of progressive loss of neurological function can manifest as diminished hearing and ringing in the ears (tinnitus), difficulty with language (aphasia) or balance problems (dysequilibrium). Technical improvements combined with medical and anesthetic advancements have made surgical removal of Brain tumors much safer and more effective. Perhaps some of the most remarkable examples have occurred in the treatment of Skull Base Tumors. There are some malignant tumors that are very sensitive to chemotherapy or radiation therapy such as Lymphoma and Germinoma. In these cases, surgery may not be warranted. Degenerative Diseases of the Spine: Degenerative and Herniated Disc disease, Spinal Stenosis (narrowing of the Spinal Canal) and instability of the Spinal Column may cause compression and injury to the Spinal Cord and/or spinal nerves resulting in neurological deficits and pain. All of these are treated by Neurological Surgeons. We invite the READER to consult an important document on this website: Why Choose a Neurosurgeon for Spine Care? Degenerative disorders of the spine are a common problem. Between 50% and 90% of the population will experience back pain at some point in their lifetime. Most of these back pain symptoms subside on their own within a few weeks. However, the cost to our society in decreased productivity and lost wages constitutes a significant public health problem. Lower back pain (in the lumbar spine) is one of the most common reason adults seek medical attention and is among the most frequent reasons for referral to a Neurosurgeon. The lumbar spine, in particular, withstands a considerable load as it supports the weight of the entire Spinal Column. 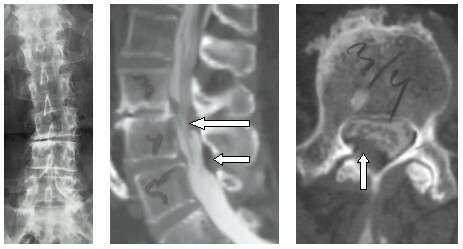 Figure 5B (Center): Post-myelographic CT Scan (Sagittal Reconstruction) demonstrating the advanced degenerative changes at the L3,4 disc space. The Spinal Stenosis (narrowing of the Spinal Canal) at L3,4 & L4,5 results from hypertrophy of the posteriorly located Ligamentum Flavum (Arrows). 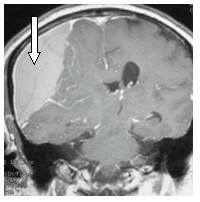 Figure 5C (Right): Post-myelographic CT Scan at the L3,4 level. The Stenosis results from a cystic degeneration in Hypertrophic Ligamentum Flavum (Arrow). The discs that lie between the vertebral bones act as shock absorbers. Cervical (neck) and Lumbar (lower back) discs are very prone to herniation and drying out (desiccation) as a result of the load they bear and the motion to which they are subjected. Degeneration of the discs may change bony structures in a way that results in the formation of bone spurs (osteophytes) which then causes nerve compression as those nerves leave the spinal canal. Typically, individuals with degenerative disorders of the spine experience pain, numbness, tingling (paresthesia), weakness in an extremity and restriction of movement of the Lumbar or Cervical regions. Congenital Abnormalities: Failures during Embryonic development can result in the abnormal formation of the Brain, Skull, Spinal Cord and Spinal Column either alone or in combination. Important changes in growth and chemistry occur during the second week of gestation of the human embryo which contributes to the development of the nervous system. Several different types of cells proliferate as they move together or separate into other structures according to an orchestrated, natural time clock. Errors that result in Developmental Defects can occur at different stages of embryonic development. These conditions may be severe and obvious at or before birth, or quite subtle and not manifest themselves until later in life. Figure 6A: MRI Scan (Sagittal View). Arnold Chiari Malformation. The Cerebellar Tonsils (Lower Right Arrow) are "herniated" below the Cerebellar Hemispheres (Upper Arrow) through the Foramen Magnum resulting in compression of the upper Cervical Spinal Cord and Medulla (Left Arrow). Figure 6B: Operative Photo. Arnold Chiari Malformation. The Cerebellar Tonsils (Lower Arrow) hang well below the Cerebellar Hemispheres (Upper Arrow) resulting in compression of the Upper Cervical Spinal Cord (Left Arrow). Pain: There are Nervous System Diseases that cause severe and debilitating pain. Among these are Trigeminal and Glossopharyngeal Neuralgias. Pain conditions of this magnitude are often first treated with medications such as anticonvulsant drugs. For many patients this may require life-long drug therapy. Oftentimes the medication either fails to continue to be effective or creates disagreeable or intolerable side effects. In these latter circumstances there are Neurosurgical procedures that can be very effective in relieving these conditions. 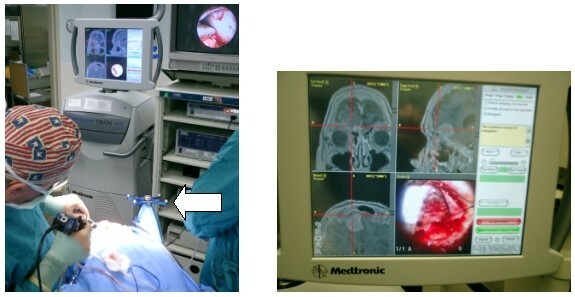 Figure 7A (Left): Operative Photo. 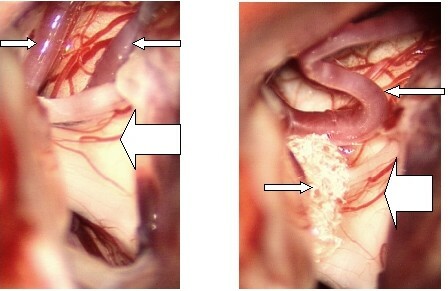 Left Trigeminal Neuralgia caused by compression/distortion of the Trigeminal Nerve (Lower Arrow) at its Nerve Root Entry Zone of the Brain Stem by an elongated atherosclerotic Artery (Upper Arrows). Figure 7 B (Right): Operative Photo (Same patient). The elongated Artery (Upper Arrow) has been transposed to an inoffensive position away from the Trigeminal Nerve (Lower Right Arrow) and held in place by a permanent Ivalon sponge (Lower Left Arrow). There are many other pain conditions that may be successfully managed by Neurosurgical procedures among which a considerable number are related to Spine Disease as outlined above in #3. Traumatic Head or Spine Injury: These are conditions caused by accidents or assaults. Accidents that result in head injury are a major public health problem. Trauma causes approximately 150,000 deaths annually in the United States; approximately half of these deaths are caused by fatal head trauma. Additionally, there are 10,000 new Spinal Cord injuries annually. The cost of disability (e.g., chronic long-term care, lost wages and work) is very high. Approximately 200,000 persons in the United States are living with disabilities consequent to Head and Spinal Cord trauma. Spine Trauma: Injuries to the Cervical, Thoracic and/or Lumbar Spine may result in injury to the Spinal Cord and/or Nerve Roots or could be related ONLY TO THE STRUCTURAL SUPPORT MECHANISM. In any of these cases, Neurosurgical consultation is appropriate. Fractured spine conditions may require surgical management either to stabilize the spine and/or relieve pressure on the Spinal Cord or nerve roots. Figure 8A (Left): CT Scan (Sagittal "reconstruction") demonstrating the Anterior dislocation of the C6 vertebral body on C7. Figure 8B (Center): Cervical Spine X-ray (Lateral View) Arrows indicate the misalignment of the Cervical Spine at C67 in the same patient. Figure 8C (Right): CT Scan (Transaxial View-same patient) The right Facet has been extensively fractured (Lower Arrow). The Right Foramen is compromised by a bone fragment from the fracture of the Uncovertebral Joint (Upper Arrow). Head Trauma: Severe head injury is defined as an injury that produces coma. These patients will not open their eyes even to painful stimulus, are incapable of following simple commands and are unable to speak. These clinical criteria are defined within a system known as the Glasgow Coma Scale (GCS). A neurological assessment by a trained physician and Brain scan imaging (CT scan) is necessary for the initial evaluation. Neurosurgeons are often involved in the management of these patients either directly or as consultants. 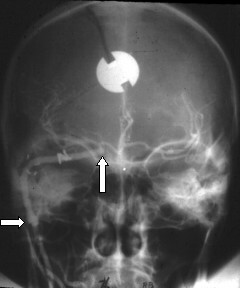 There are times when surgical intervention is required such as when the skull bones have been fractured and driven into the brain (a depressed skull fracture), when there is a large blood clot that can cause progressive Brain injury or when a special catheter to monitor intracranial pressure (due to Brain swelling) is inserted. 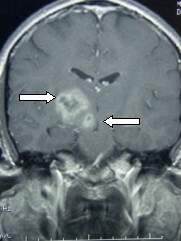 A large Right-sided Subdural Hematoma (Arrows) has caused considerable "shift" of the midline Brain structures. Stereotactic Neurosurgery makes use of a coordinate system that provides accurate "navigation" to a specific point or region in the Brain. There are two main types of these systems. One involves placing a frame onto the head (using four threaded pins that penetrate the outer skull to stabilize the frame in position) under local anesthesia. Once the frame is in position, a special box and stereotactic arc are placed to precisely determine X, Y, and Z coordinates of any point within the frame. The other technique, called "Frameless Stereotactic Surgery", uses different technology that is based upon concepts similar to a "Global Positioning System", except in this case the systems are either optically or magnetically based rather than using "satellites in the sky". Figure 10A (Left): Operating Room Photo. Minimally Invasive Endoscopic Resection of a Skull Base Tumor using Image Guidance. The "Reference" source for the Guidance positioning system is fixed in place (Arrow) as is the patient's skull. Figure 10B (Right): Image Guidance Monitor. The surgical instrument's "tip" and its location within the Skull (relative to the LOCATION OF THE TUMOR) is indicated by the "cross hairs" on each of the 3-dimensional views. The operative view is relayed from a miniature camera attached to the endoscope (Bottom right). Epilepsy (seizures) is a serious health problem for which approximately 70 per 100,000 people in the United States take antiepileptic medications. The risk of developing epilepsy over a lifetime is 3%, and there are 100,000 new cases per year. The majority of cases (approximately 60,000) involve the Temporal Lobe portion of the Brain. Approximately 25% of patients prescribed antiepileptic drugs for Temporal Lobe seizures are not adequately controlled or the side effects of the drug are far too great and outweigh the therapeutic benefits. It is estimated that 5,000 new cases of epilepsy per year require epilepsy surgery. In the case of Temporal Lobe Epilepsy this consists of removing the front part of the Temporal Lobe (a Partial Anterior Temporal Lobectomy.) Surgery may be appropriate if frequent seizures cause injuries due to repeated falls; driving restrictions; limitation of social interactions; problems related to education and learning; and employment limitations.